As you may have guessed from our social media posts, the Girl Meets Dress buyers and social media team have been very busy with London Fashion Week (LFW), running around London to get to all the shows, to seek out what’s going to be on trend for AW18 and we’ve already placed orders on dresses for you to hire that we think will be popular for the coming season. At the Richard Quinn show yesterday, we were graced not just by the likes of Anna Wintour aka fashion royalty, but Her Majesty The Queen made an unprecedented appearance. All of the Girl Meets Dress team, were major fangirling, but obviously we still kept our focus on the dresses. Of course she was in the front row and she awarded Quinn with the inaugural Queen Elizabeth II Award for British Design. This is the first time the Queen has graced her presence at LFW. 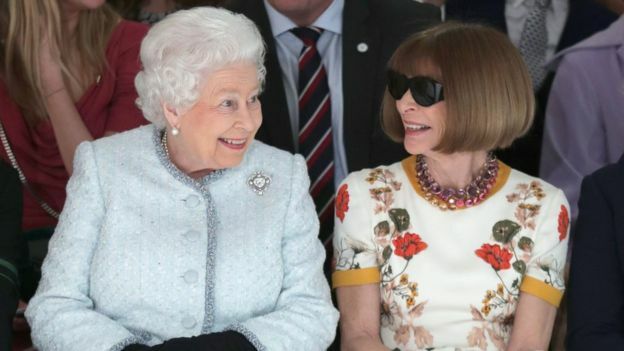 The Queen sat next to Anna Wintour. Don’t they both look lovely? Feel inspired by the Queen’s pastel blue ensemble or Anna Wintour’s floral dress? Then why not hire one of our day dresses? 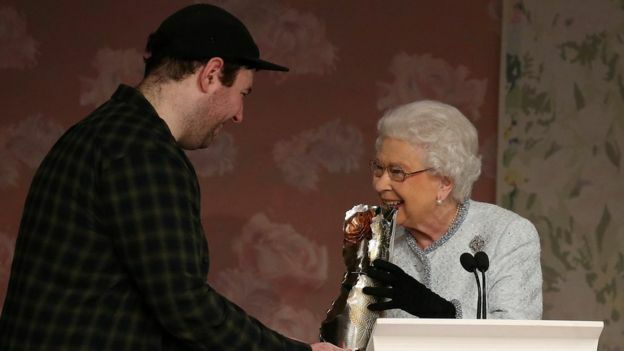 Here the Queen is awarding Richard Quinn with the inaugural Queen Elizabeth II Award for British Design. With Girl Meets Dress, you can now hire the catwalk, as the dresses you see on the Girl Meets Dress website, are always fresh off the runway. Posted February 21st, 2018 in GMD Daily. Tagged: Catwalk report, Designer dress, Designer dresses, Dress Hire, dress of the week, Fashion, Girl Meets Dress, Gorgeous Couture, hire, hire a dress, hire celebrity dresses, hire cocktail dresses, hire designer dresses, Hire dresses, LFW, LFW AW18, London Fashion Week, London Fashion Week AW10, long dresses, party dress, party dresses, Prom dress, rent a dress, rent celebrity dresses, Rent designer dresses, rent dresses, Richard Quinn, short dresses, The queen at lfw, The queen at london fashion week.